BROOKLYN, NY -- Your cardiologist may disapprove of New York City's latest viral food invention, but at least Mother Nature will thank you. 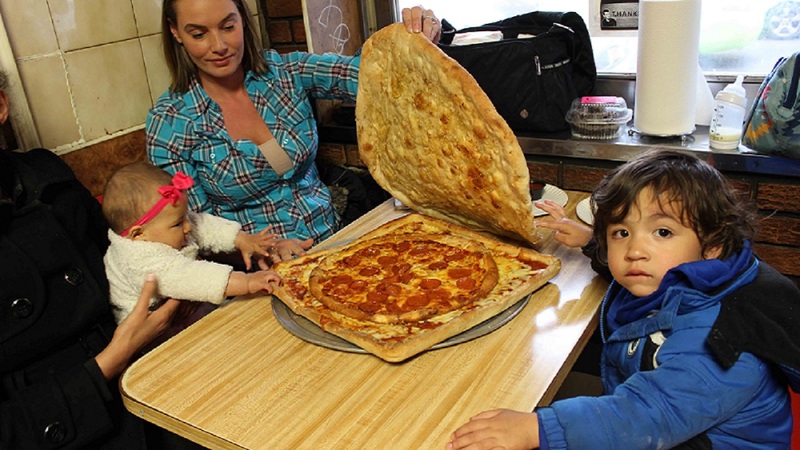 Vinnie's Pizzeria in Williamsburg, Brooklyn now dishes out the Pizza Box Pizza, a classic New York-style pepperoni pie encased in two larger square pizzas. Since cheese goo ruins the recyclability of standard cardboard pizza boxes, this edible container is technically a greener alternative. "I see a lot of people ask for boxes all the time, and then just throw it directly in the trash right after they finish their food," said Sean Berthiaume, Vinnie's Pizzeria owner and Pizza Box Pizza creator. "It gave me inspiration to try to make something where you can eat the box as well. It kind of started as a joke, and then it just kind of blossomed." Social media certainly helped. On April 27, @vinniesbrooklyn tweeted a picture of the Pizza Box Pizza with the caption: "Introducing The PIZZA BOX PIZZA! A pizza box made entirely out of pizza! No waste, 100% pizza and 100% delicious." With a seed planted in the fertile Twittersphere, the Pizza Box Pizza reached that Rainbow Bagel-type of viral popularity. In the days following, Berthiaume said Vinnie's was extremely busy, filling up to 40 Pizza Box Pizza orders per day. At least he is familiar with this digitally driven attention. Berthiaume's Instagram picture of a pizza-topped pizza swooned the Internet last May, landing him an interview with Jimmy Kimmel. Mike Cohen, of North Carolina, heard about the Pizza Box Pizza online and visited Vinnie's Pizzeria May 1. It did not disappoint. "It's everything my heart thought it would be," he said. Customers can order Pizza Box Pizzas for pickup or delivery, although Berthiaume has yet to perfect the delivery process. They cost $40 each.